FARMERS / CRAFTER’S MARKET Join us every Friday during the summer months from 12:00 to 5:00 in the City Park (weather permitting). New vendors are always welcome! The City Park is open to the public for all to enjoy. 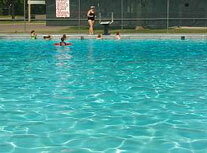 With the convenience of the municipal pool located just North and several shelters to use for all occasions. Newly updated playground equipment with slides, swings, and much more, your children will enjoy every moment. The City does not regulate those who want to use the shelters, the park is a first come first serve basis. Please be courteous and use the garbage containers provided in the park to throw away any trash. Overnight parking/camping is not allowed in the City Park.